For anyone who was a committed gamer in the early 1990s, Sensible Soccer was almost a must-have football game; Codemasters created a ridiculously playable sim which was great as a single player and fantastic as a multiplayer. Ludicrous team names, headed goals from the half way line – Sensible Soccer had everything and deservedly became something of a cult product. 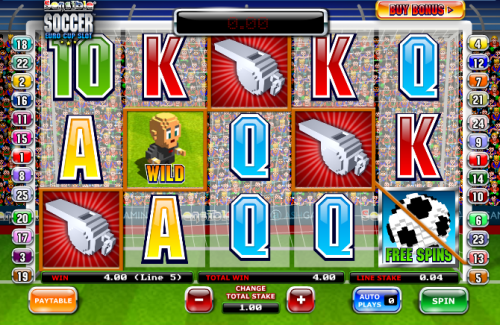 As you might imagine then we were delighted that Ash Gaming grabbed the licence to produce this enormously entertaining online slot; it may lack some of the polished graphics of newer games but it has a bonus game like no other. The backdrop to Sensible Soccer Euro Cup Slot is a packed stadium and the basic symbols are 10, J, Q, K and A. Higher value symbols are a whistle, a stadium and the game’s logo. There are three wild character symbols – a referee (the banker), a spectator (the fanatic) and a goalkeeper (the wobbler) – and all the symbols are close up sprites, brilliantly making them look slightly like lego people. There are two scatter symbols, one is a European Cup bonus image and the other is a football. As we’re obviously Sensible Soccer fans, we think the bonus game is the best we’ve ever seen; land three of the Euro Cup bonus symbols on the reels and the round will start. It’s essentially a domestic European Cup competition and you start by selecting a team. There’s a variety of Europe’s top teams and once you chosen you can watch as the highlights of a two-legged fixture play out. This is Sensible Soccer action as you remember it! You can skip the highlights if you want and just go straight to the result. The further you progress the more money you win and each team has it’s own multiplier. There’s also a progressive jackpot available here and it’s triggered by a total score of more than ten goals in one of your two-leg fixtures. Check out the bonus game below. If you don’t want to wait for three scatter symbols to line up you have the option of just buying your way to a bonus round; there’s a ‘Buy Bonus’ button on the top right corner which will cost you 30x your line stake. The Banker – 15 free spins and if the banker appears on reel two then at least one reel will turn wild. The Fanatic – 10 free spins and if the fanatic turns up on reel three then the symbols below and on other side will be wild. The Wobbler – 20 free spins and if the wobbler appears on reel four, random symbols will be wild. This is just a great slot and if you were a fan of the original game this will leave a smile on your face, especially if you make it to the bonus game. There are five reels and twenty five fixed paylines meaning that stakes vary from £0.25 to £20.00 per spin.